2019 Email Marketing Research: 4 Key Findings to Improve Your Results | Make Money And Work At Home .com If your browser shows this site in not secure just add an s to the http and it should show a padlock or a mixed content message. All of our websites have SSL and may even have other plugins to ensure your security. Email marketing may not be a new marketing tactic. In fact, the first electronic mail was sent in 1971, the first email marketing blast was sent in 1978, and in 2018, it was estimated that 124.5 billion emails were sent out. Yes, email marketing is an established tool in your toolbox. But should not assume that what worked a few years ago will work today. A new research study I worked on, Email Marketing Survey Summary Report, finds that email marketing professionals are learning new techniques to improve their email marketing results. What are the primary objectives of an email strategy? How many companies are best-in-class? What are the most critical challenges to success (know the challenges in advance to prepare how you will handle your challenges)? How much are budgets changing for email marketing? NOTE: this information will help you make the argument to get more budget. 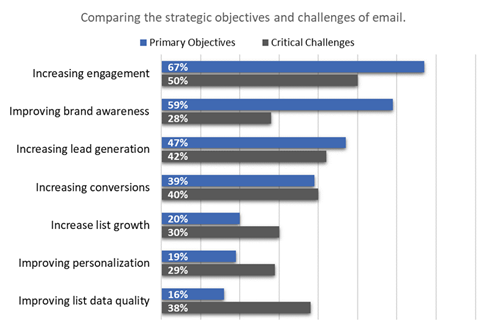 How do I prioritize objectives versus challenges as I build my email strategy? What are the most effective types of email? How is effectiveness changing for the types of emails used? What are the most difficult types of emails deploy? What combination of resources (in-house, outsourced to a specialist) are other companies using? Here are 4 key findings from our 2019 email marketing research that will give you insight on how to adjust your email marketing strategy and improve your results. Increasing engagement and improving brand awareness are primary objectives for 67% and 59% majority of marketing influencers, respectively. Engagement is now a frequent topic of conversation as companies strive to increase waning email open and click rates. Increasing engagement and improving brand awareness are primary objectives for 67% and 59% of marketing influencers. Engagement continues to be a strategic objective for marketing professionals, whether it is email, social media, content marketing, customer experience, personalization, etc. Increasing engagement requires a commitment by you to invest the time to outline your strategy and allocate the financial resources (start small) implement your strategy. Through years of testing and experimentation, we’ve found that research is an excellent way to increase engagement with our audience. Everyone is interested in research because it helps them do their job better by giving them ideas on what to do based on results from their peers. Because the research helps our audience, they engage with us by downloading reports, sharing the research, commenting on research findings, asking questions, etc. Do you have a similar strategy on how you are going to increase engagement? Now is the time to outline your strategy and start engaging your audience! 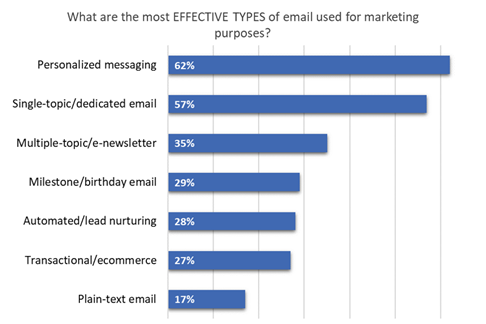 What are the most effective types of email used for marketing purposes? A majority of marketing professionals believe that a combination of personalized messaging and single-topic/dedicated email creates the most effective type of email used for marketing purposes. Meanwhile, only 17% consider plain-text email effective. A majority of marketing professionals believe that personalized, single-topic/dedicated emails are the most effective type of email. Do you see how knowing your audience, great content, and data are critical to creating a personalized message for your email marketing? So by creating your strategy to increase engagement, you will also have the tools necessary to deliver effective personalized email campaigns. The good news is that while email marketing has been around for a long time, marketing professionals are finding ways to increase effectiveness. While nearly two-thirds (64%) of marketing professionals say email effectiveness is improving moderately, only 21% consider email effectiveness to be worsening to some extent. Good news! 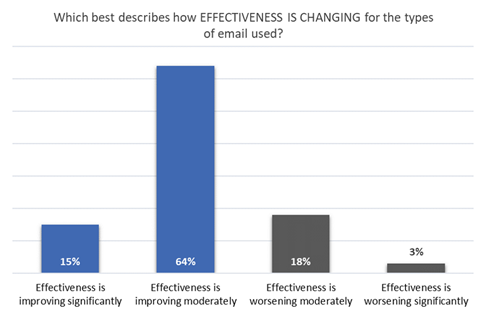 64% of marketing professionals say #email effectiveness is improving moderately. 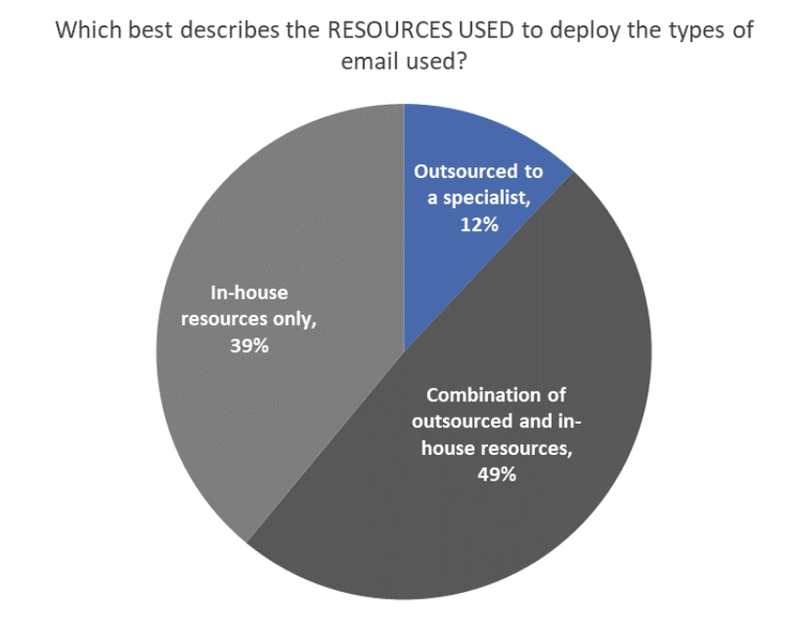 While difficult types of email (like personalized messaging driven by artificial intelligence) are driving the need for outsourced specialists, 39% of marketing professionals say they still only use in-house resources to deploy the types of email used. Get more research insights by downloading the entire study, Email Marketing Survey Summary Report, and put it to work in your own email marketing strategy. 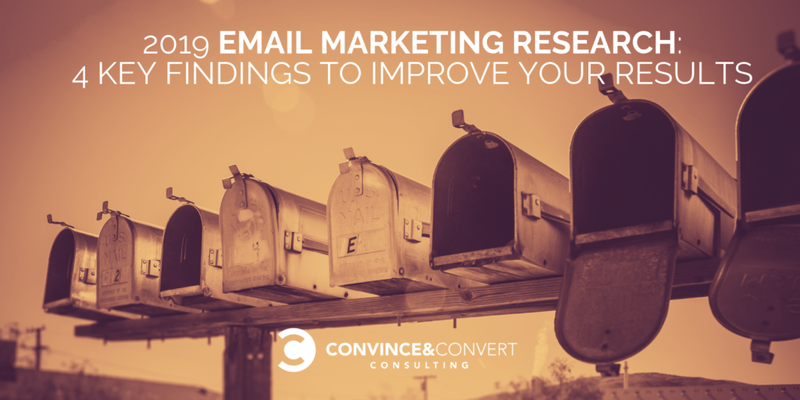 The post 2019 Email Marketing Research: 4 Key Findings to Improve Your Results appeared first on Convince and Convert: Social Media Consulting and Content Marketing Consulting.